For extremely corrosive applications, our Lined Adapter is an economical solution. 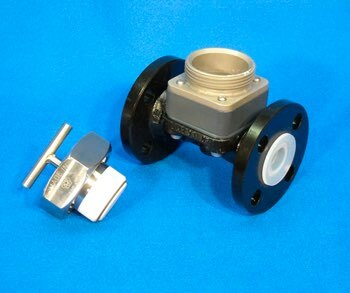 Commonly referred to as a Saunders® adapter, this three part adapter uses an off-the-shelf Tefzel® lined diaphram-type valve body along with our custom manufactured Teflon® mounting block sandwiched together with a s/s plate. This configuration allows for the process to only be in contact with the non-metallic components. The suggested orientation of the sensing head is on a horizontal plane. A vertical segment of pipe is also acceptable. Special maintenance plugs are available from several different materials for operation without the sensing head installed. Please contact us for more information.